Our company was started by Brooke Kline. 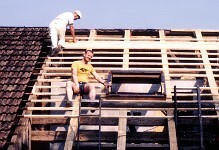 After WWII, Brooke worked for Standard Roofing, a company that focused on slag and tin roofing. In the 50s and 60s, Brooke began to build his own roofing and handyman business by going door to door in Reading and passing out his business card. By the early 70s, Brooke had enough loyal customers to operate full time, and he officially established his business in 1971. It grew and flourished, and in 1974, his son Roy joined him. Together, they took painting and wallpapering lessons at the local career and technology center to help stay busy during the winter months. By the 1980s, business was booming, and Brooke and Roy could no longer handle the work load on their own. In 1986, Roy Kline became the new owner and hired two new workers. As the years passed, our business continued to expand in size and areas of expertise. A full-time carpenter was hired in 1992, and allowed us to become experienced in providing not only quality roofing, painting and wallpapering, but also carpentry, siding, window and door replacement, and small remodeling jobs. In 1995, Roy's son Seth joined the business full-time. By that time, we were able to rely primarily upon our loyal customers and their referrals for new customers and work. The business continued to gain experience in providing a variety of custom work. In 2006, in order to effectively streamline our company, we officially became Roy B. Kline & Son Inc. In 2007, Roy's second son, Josh (who had been working part-time for us for several years) joined the business full-time. We continue to provide a wide variety of quality workmanship for our customers, including home additions, kitchen and bathroom remodeling, custom interior and exterior remodeling, as well as our standard roofing, painting, and wallpapering. Our founder, Brooke Kline, focused on providing a high level of customer service, which is a tradition we continue today. We strive to maintain a clean and orderly jobsite, and we hire employees that inspire confidence and respect. Many of our customers trust us to complete their remodeling in a professional manner even while they take their vacations! We always strive to help our customers understand their options, and we have the flexibility and skill to allow for custom job elements. Above all, we provide quality workmanship along with friendly service for a fair and affordable price. For more information on our capabilities and reputation, feel free to browse through a sample of some of the jobs we have performed over the years in the Our Work section of the website. You can always contact us if you have a question.